FONGE W3 in-ear headphone with 12mm driver unit provides natural clear sound and super enhanced bass. Noise-isolating in-ear design blocks ambient noise to help you focus on listening pleasure. High-quality in-line microphone and remote allow seamless control of phone calls, music and volume. 3.5mm headphone is suitable for smartphone, tablet PC, laptop, MP3 and other 3.5mm audio devices. Adjustable earbud brace and 13 degrees tilted in-ear ear cap fit the ear canal, not easy to fall, suitable for sports and daily use. Magnetic metal earphone head design enables it being hung around the neck when not in use. 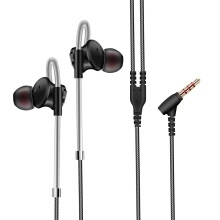 In-ear headphone with 12mm driver unit provides natural clear sound and super enhanced bass. Noise-isolating in-ear design blocks ambient noise to help you focus on listening pleasure. High-quality in-line microphone and remote allow seamless control of phone calls, music and volume. 3.5mm headphone is suitable for smartphone, tablet PC, laptop, MP3 and other 3.5mm audio devices. Adjustable earbud brace and 13 degrees tilted in-ear ear cap fit the ear canal, not easy to fall, suitable for sports and daily use. Magnetic metal earphone head design enables it being hung around the neck when not in use.